I offer psychotherapy, including body psychotherapy, somatic experiencing, brainspotting, equine-facilitated therapy, and energy healing sessions for adolescents and adults. I specialize in trauma, sexual, physical, emotional abuse, and eating disorders. Prenatal and Birth Training, with Ray Castellino, DC, RPP, RPE, RCST, facilitating the resolution and repatterning of prenatal and birth trauma imprinting for people of all ages. 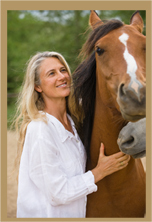 I have practiced as a body psychotherapist and energy healer in Europe, South America, and the Middle East. I have also worked with torture survivors as a licensed physical therapist at the University Hospital of Geneva (Switzerland). My own healing journey and spiritual growth is based upon integration of my whole being. Most importantly, I approach therapy and healing with creativity, integrity, compassion, and respect. I speak English, Spanish, French, and German fluently.